Details: Poultry meat and skin. Gelatin Silver Print. 20" x 24"
The Replete Series consists of twenty photographs of elaborate configurations of meat and skin. Employing a Baroque vernacular of beauty, I stage the relationship between representation and materiality at the site of a contingent and exuberant corporeality. The allotropic nature of photography is emblematic of this embodiment; the figure pictured is at once promised to be a real body and yet it is fabricated and manipulated. 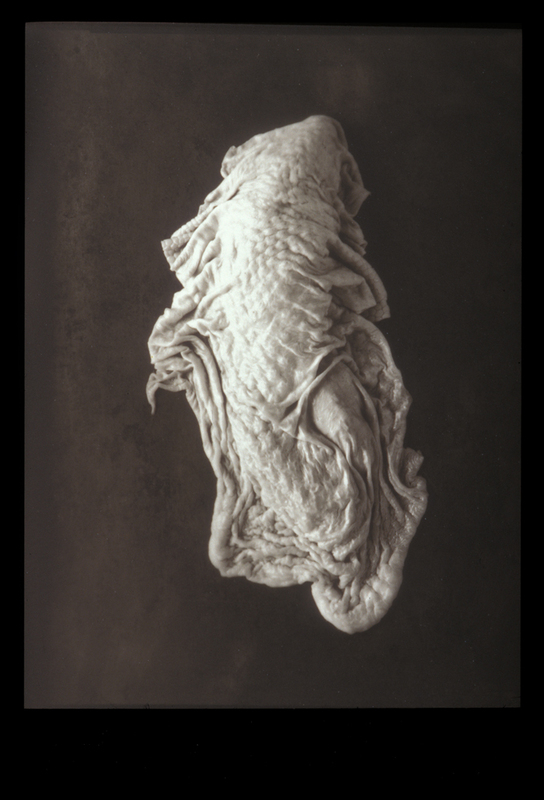 Recalling the violent unveilings and exquisite detail of Enlightenment-era dissection engravings, as well as the sensuous lighting and singularity of Nineteenth Century medical photographs, the Replete Series appropriates this prickly beauty while inverting the aestheticization of pathology. In the details of art history a pathology of aesthetics emerges in the contraposto and rippling folds. The figures oscillate between being perceived as an abject part or fragment that has been torn from the body- and whole bodies, resplendently draped and displayed. They suggest a fleeting fullness, recalling the frenzy of folds in Bernini’s Ecstasy of St. Theresa, or a glimpse of a triumphant Assumption, before collapsing into a fragment, detritus, or by-product. Partial but present, replete and incomplete, The Replete Series grapples with the complexity of corporeality as a site bound up in living bodies, breathing texts, and pictures that prick. © 2019 Mary Beth Heffernan All Rights Reserved.